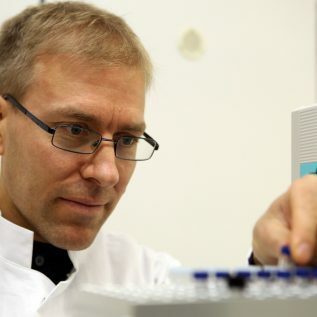 The postdoc on the German side of the LOMVIA team is Dr Thomas Larsen who obtained his MSc in zoology from Aarhus University and PhD in isotope ecology from University of Copenhagen. His research focuses broadly on how nutritional relationships between consumers and resources affect ecosystem functioning, and how anthropogenic activities affect food webs. Larsen and his group pioneered a new method, isotope fingerprinting, which can identify and quantify amino acid sources consumers in situ. Amino acids can be traced to their biosynthetic origins because δ13C variability among individual essential amino acids (δ13CEAA) are distinct among major taxonomic groups such as algae, bacteria, fungi and vascular plants. These source diagnostic δ13CEAA patterns or profiles are also called fingerprints. This contribution clearly stands out in the field of tracer ecology because the isotope fingerprints remain invariant across different environmental conditions, they can characterize food web linkages across various systems, and identify the geographical locations of aquatic consumers. Since these proteinogenic amino acids are central for all life forms, Larsen’s research has a multidisciplinary character linking processes from the scale of individual organisms to landscapes. In the LOMVIA project, Larsen will apply his expertise with isotopes and complex dietary modelling to characterize the prey of boreal and arctic guillemots across time and space. LOMVIA is co-funded by the German Federal Ministry of Education and Research and by NERC.